Hi, my name is Archana and I am allergic to chicken. As a child I was chicken’s number one fan, from chicken McNuggets to chicken tikka masala and everything in between. But I especially loved my mom’s tandoori chicken. One time, my mom cooked a huge batch of tandoori chicken for a dinner party. Being a portly 4th grader, I piled several pieces of breast, thighs and drumsticks onto my plate and chomped away. Then I went back for seconds, and eventually thirds. The next day, despite my gluttony, there was actually some left over that my mom made into a chicken biryani which I also heartily devoured. That was when something went horribly wrong. My face started burning. When I went to the mirror my face and body had turned the same crimson hue of the tandoori chicken I had recently injested. Of course my parents were alarmed at their ruby red child and we rushed to the doctor, who gave me a series of injections to find out why I was so sanguine. 25 pricks later the culprits turned out to be chicken, eggs, and chocolate. That was the day my chicken boycott started. (I conveniently disregarded the eggs and chocolate). It took me over twenty years to get past my chicken phobia. Only after having kids and reading more about child allergies (and how kids usually grow out of them) did I find the strength to take a bite of my feathered friend again. Unfortunately, I had so eagerly anticipated my chicken reunion that when I finally had my first taste, I was bitterly disappointed. This can’t be right. Everyone told me all these years that I was “missing out”. But missing out on what? I tried chicken again baked, broiled, fried, curried, and breaded, but nothing really amazed me. After years of substituting beef, lamb, fish, and even turkey in my diet, chicken paled in comparison. I couldn’t find any preparation to justify reincorporating chicken into my menu…until now. I finally found a bold and flavorful recipe to combat chicken’s blandness. My version of Eating Well’s chicken tacos has definitely got me believing the bird is the word! Sour cream or yoghurt as garnish. Heat a medium skillet over high heat until very hot. Add tomatoes and cook, turning occasionally with tongs, until charred on all sides, about 15-20 minutes. Transfer to a plate to cool slightly, then chop. Cut chicken into 1-inch chunks; sprinkle with salt and pepper. Add 2 teaspoon oil to the pan and heat over high heat until very hot. Add the chicken and cook, stirring occasionally, until it is browned and no longer pink in the middle, 3 to 5 minutes. Transfer to a plate. Reduce the heat to medium and add the remaining 2 teaspoons oil. Add onion and cook, stirring, until softened, about 2 minutes. Add garlic and jalapeño and cook, stirring, until fragrant, about 30 seconds. Add lime juice, cumin, the chicken and tomatoes. Cook, stirring, until heated through, 1 to 2 minutes. Stir in cilantro and scallions. Heat small skillet and warm the tortilla on both sides. Put ¼ cup cheese on tortilla and heat until melted. Top with chicken mixture. Serve with lime wedges and dollup of sour cream or yoghurt on top. 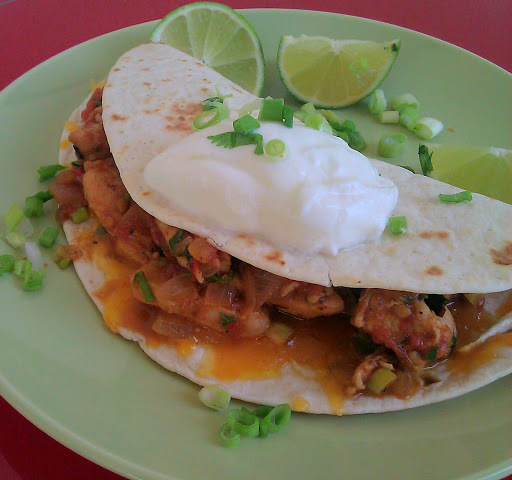 This entry was posted in Main Course and tagged Chicken tacos with charred tomatoes, healthy by thepantrydiva. Bookmark the permalink. These look tastee!Hey, remember those brownies you made one day when I came over? Can you make those and post the receipe? They were really, really good. Yes will find the recipe and post for you…I think I purposely lost it since I was dieting!